The Westhill branch of Town & Country is located centrally, to the rear of the main shopping centre, directly opposite the Westhill Hotel and is conveniently located for this constantly growing and thriving community and the surrounding country areas. 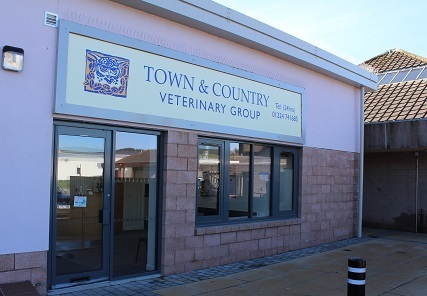 It was originally a branch of the Banchory practice and run on a part-time basis but is now manned throughout the day by Veterinary surgeon Karen Shewan. She is in charge at Westhill assisted by 4 part-time receptionists with consulting sessions morning, afternoon and evening. Meet the team. We stock pet food, leads, collars, toys and much more. If you don't see it on our shelves we can usually order it in for you the following day. Please note that the area to the front of the practice is NOT public parking as this is a delivery area for the shops. We would ask that clients park in the main car park to the rear of the practice, accessible from Old Skene Road.